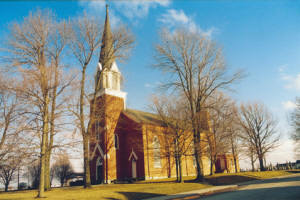 Mary Help of Christians Church is located in Ft. Recovery just east of 49 on Sharpsburg Road. 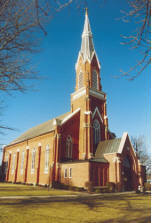 Mary help of Christians Church was established with 25 families in 1881 in Ft. Recovery. Mrs. Jacob Anthony, Sr. was given the honor of choosing the patronal name of the new church. 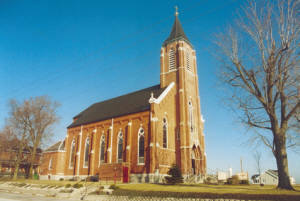 All of the early Mary Help of Christians parishioners were baptized in St. Joseph, the Mother Church. Depending on the weather, the parishioners would travel either by horse and buggy or sometimes they rode the train to St. Joe. Rev. Augustine Seifert, C.PP.S., the founding pastor, guided the parish in constructing its first humble little church at the cost of $1,200 and seated 100 people. He also started the parish school staffed by the Sisters of the Precious Blood. In 1885 an eleven-room rectory was constructed at a cost of $3,000. In the next ten years the pastors of St. Joseph resided in Fort Recovery, and for awhile one priest cared for both parishes. In 1888 Rev. Jacob Marte, C.PP.S., guided the erection of a new two-room brick schoolhouse. Rev. Bernard Dickman, C.PP.S., came as pastor to lead the parish of sixty families to the building and dedication held on August 15, 1902 at the new Mary Help of Christians Church located on South Wayne Street. The church building cost was $16,000. The stations of the cross, the beautiful stained glass windows, the altars and the bells were installed from 1906-1917. In 1921 the parish then constructed a new St. Mary’s Schoo0l. Under the leadership of Rev. George Heinzen, C.PP.S., the parish consisting of 225 families celebrated its 75th anniversary in 1956. He also oversaw the construction of a new Sister’s Convent that was finished in 1958. In 1961 an addition of a cafeteria and parish hall was added to the school. In 1974 the Rev. Fred Falce, C.PP.S., was appointed the pastor to help with the controversial subject of whether the parish should expand and renovate the present church, or replace it with a modern church which would be better suited to serve both the present and future needs of the parish. On March 28, 1976, ground breaking ceremonies were held for the new church that would be erected on the corner of State Route 49 and Sharpsburg Road. A year and a half later on December 11, 1977, Mary Help of Christians Parish, consisting of 350 families, dedicated the beautiful new church. The stained glass windows from the old church were incorporated into the present church. The bells were also saved and erected into a bell tower during the church’s centennial year. A new rectory and offices were constructed connecting the church in 1979. The old church was razed in the summer of 1978 and the former rectory is now a private family residence. The school and convent were sold to the Southwest Local School System in 1979. 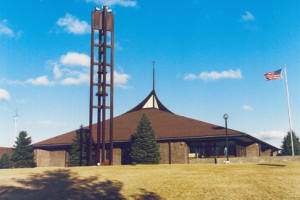 In 2004 the church became part of the Fort Recovery Cluster consisting of the following parishes: St. Joseph, St. Peter, St. Paul and Mary Help of Christians. After several more interior remodels, the latest in 2010 and 2016, MHC has over 575 member families and continues to grow.